All practices held at Cowling Gym. Badminton! It’s a blast! Whether you’re a complete beginner or a hardened veteran of this noble racket sport, we’d love to have you come play with us at Club Badminton. We practice three times a week in Cowling, usually Monday and Wednesday nights and Saturday afternoon. Bring your friends and play some informal games, or come and hone your skills with a few drills we run every practice. Every term we try to organize either a tournament against St. Olaf or a competition within the Carleton community. Show up some day if you can – we’re always excited to have new members join our community, regardless of commitment or skill level. You won’t regret it! The Badminton club grew out of the intramural Badminton program at Carleton. In 1995 we petitioned to become a club and our first officers were Kevin Packard and Belinda Bertolozzi. For the 95-96 school year Keith Foss led the club with Michele Nichols. Spring 1996 two of our members, Michele Nichols and Keith Foss, participated in the National BCD tournament which was held in Minneapolis. In the spring of 1995 the National tournament was also held in Minneapolis, and three of our members attended with a singles and a mixed doubles team making it into the B flight. Also, that year during winter term four of our members traveled to the Minneapolis Athletic Club tournament and the mixed doubles team of Michele Nichols and Eric Bass won the runners up prize in the tournament. If you are an alum and have more information about the history of Badminton at Carleton, please contact Aaron Chaput so that we can make our history more complete! Applies principles of the fighting arts toward the goals of peace, harmony, and self-improvement. Provides the Carleton community with an opportunity to explore the joys of alpine skiing and snowboarding, both as a sport and as a recreation. Gives members of the Carleton Community an opportunity to play Badminton on a regular basis. We practice a wide variety of Ballroom and Latin dances at the competitive level. Think Dancing with the Stars, Carleton style. One of the nation's dominant teams in men's college ultimate. Promotes bicycle road racing at the College. Provides a fun and encouraging environment for women to develop ultimate frisbee skills and compete at an intercollegiate level. Competes in horse shows and provides lessons in horsemanship. A competitive Carleton men's ultimate team. Men's Ice Hockey provides Carleton students of all skill levels an opportunity to play competitive club hockey in the Midwest. The Carleton Men's Lacrosse team is a competitive intercollegiate program in the Upper Midwest Lacrosse League, a group featuring a number of MIAC schools. A team of people who enjoy cross country skiing and racing at a competitive level. The Club Sport program welcomes the arrival of the Synchronized Swimming team. Syzygy is one of Carleton's women's ultimate teams. A forum for skilled veterans and eager beginners alike to learn, teach, share and enjoy the extraordinary game that is Table Tennis. Engages in practice and competition of this ancient Korean martial art. Provides water polo instruction, practice, and local competition. Provides the opportunity to participate competitively in the great game of hockey. Teaches the basics and provides intercollegiate competition for players of all experience levels. Anyone interested in trying a new sport is encouraged to come out and play with us. We promise that playing rugby will be one of the best decisions of your Carleton career. Policy for the participation of Transgender athletes within Club Sports, Intramurals and Varsity Sports. 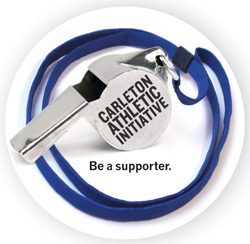 Help support outstanding athletics at Carleton College.